Wichita has many real locations rumored to be haunted, but if you’re looking for an authentic scare at a haunted house this Halloween, check out these ghostly attractions. Halloween in Wichita means Field of Screams, celebrating its 15th year of giving visitors a good scare. The creepiness starts outside the gates that take you to where the “fields are sick” and only intensifies once you’re walking through the buildings and large sorghum field that make up the legend of the Jebediah Spurlock family and their killing grounds. This outdoor haunted attraction in west Wichita also includes Clown Town. You will encounter live actors and many special effects. The walk takes approximately 30 minutes. Field of Screams runs Sept. 28-Nov. 4, including Friday, Saturday and Sunday evenings. Tickets start at $15 a person. Buy in advance for a specific time to save time. It is located at 4055 N. Tyler Rd., Maize, KS 67101. Another perennial favorite among Wichita haunted attractions is the Wicked Island at O.J. Watson Park. Mutants, clowns, spiders and snakes make this walk along haunted paths the scariest 30 minutes of your life … if you can make it through. They also offer a separate ticket experience: Wicked Island Escape Room, where your group has 30 minutes to try to solve the puzzles to work your way out of a horror-themed escape room. Wicked Island runs Friday and Saturday nights from Sept. 28-Oct. 27 and they are open on Halloween this year – Wednesday, Oct. 31. It is located at 3022 S. McLean Blvd., Wichita, KS 67217. Tickets for the haunted forest are $20 adult/$15 for ages 12 and under (must be accompanied by an adult). A fast pass is $35 for all ages. Tickets for the escape room are $40 for the first two people and $10 for each additional person; be sure to call to make a reservation, as space is very limited. Save your escape room ticket stub for a discount to the haunted forest. This hour-long walk on the trails at Lazy Bucks Ranch takes you through the woods where creatures lurk. Haunted Acres is a fundraiser for the Wichita Children’s Home, and the trail is meant to be scary so organizers ask that you please be mindful of that if you choose to bring children. This event happens just two days: 8 p.m. to midnight on Oct. 26 and Oct. 27. Tickets are $10 per person and an adult must accompany children under 14. Lazy Bucks Ranch is located at 7000 W. 79th St S. in Haysville. The family-friendly Pumpkins at the Park at Tanganyika Wildlife Park just west of Wichita includes two activities for the older kids and brave adults. The Cage Maze of Doom features some of the park’s scariest creatures as you make your way through a haunted maze. It is included in the price of admission for Pumpkins in the Park, which start at $15 per person. The Zombie Task Force Tactical Laser Tag Experience is a separate ticketed activity. Teams of five take on dozens of zombies during this 20-minute battle. You’ll use state-of-the-art tactical laser (tag) rifles. Cost is $10 per person. These activities are open 6-9:30 p.m. Oct 19-21 and Oct 26 – 28. Tanganyika is at 1000 S. Hawkins Ln., Goddard, KS 67025. Looking for something less terrifying than a haunted house while enjoying Halloween in Wichita? 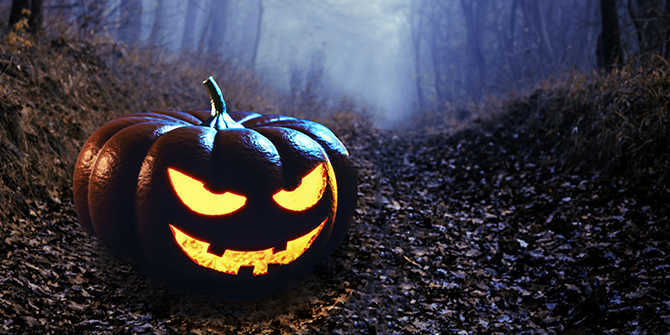 Check out this year’s list of Wichita Halloween events for the whole family or read about the most haunted places in Wichita.